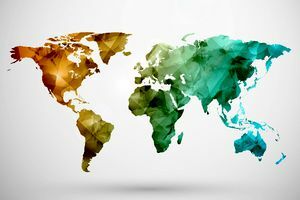 Wondering if you can pass this world map quiz with flying colors? Then it's time to put that knowledge to the test! Show us what you know, and we'll give you a score! Most people don't get 21/29 on this quiz! Think you can do better? Get the right answers, and show us how knowledgable you are about the world's geography! Answer 29 questions about the world map. Where countries are, where continents reside, and even surrounding oceans. Then we'll give you a score. Think you can pass it with flying colors?